Remember that one time, when it was summer? Ya know. That whole four days we had a few weeks back? 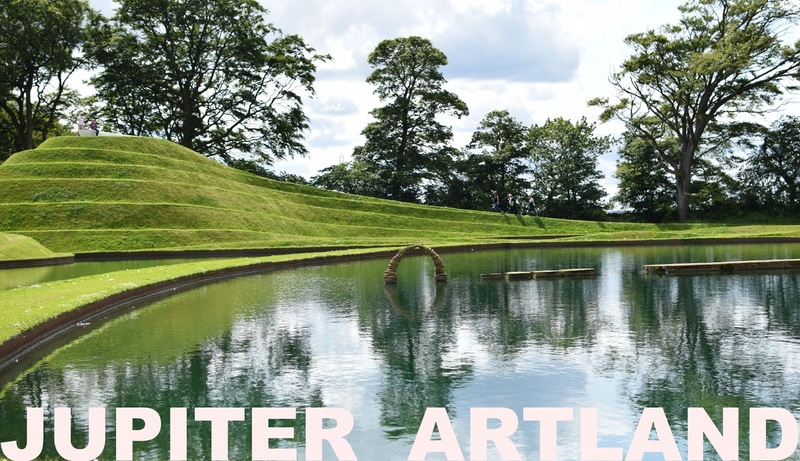 Anyway, the reason why I'm ranting about the weather (other than it being an age thing) is the next time it is dry weather you have, HAVE TO, visit Jupiter Artland. If you've been before I know you're nodding in absolute agreement with me, and if you've not, you are going to love it. Set in acres of land is a stunning outdoor gallery filled with all sorts of artwork and installations. There is no set way for you to go, no begining or end, just a continuous journey of discovery where at points your breath will honestly be taken away. Armed with our map, I have to say I just loved the non set route approach, with a headstrong three year old in tow it was refreshing to not have to utter the words, nooooo not that way......this way! (Cue crying. Cue meltdown city. Cue bribing) Instead Caleb bounced ahead eager to see what was around each corner, as did we. Gahhh where's my baby gone?! My almost walking, climbing crazy boy. I just adore how he loves to feed us, albeit even when it is a half eaten soggy crisp. See what I mean?! So cool, hey. I'm so glad I found your beautiful blog on moms blogger club. Your pictures are absolutely stunning! I have also wanted to take my boys there since my stepdad is from Scotland.